This article is about the minister of King Henry VIII of England. For other uses, see Thomas Cromwell (disambiguation). Thomas Cromwell, 1st Earl of Essex, KG, PC (/ˈkrɒmwəl, -wɛl/; c. 1485 – 28 July 1540) was an English lawyer and statesman who served as chief minister to King Henry VIII of England from 1532 to 1540, when he was beheaded on orders of the king. During his rise to power, Cromwell made many enemies, including his former ally Anne Boleyn. He played a prominent role in her downfall. He later fell from power, after arranging the king's marriage to German princess Anne of Cleves. Cromwell had hoped that the marriage would breathe fresh life into the Reformation in England, but Henry found his new bride unattractive and it turned into a disaster for Cromwell, ending in an annulment six months later. Cromwell was arraigned under a bill of attainder and executed for treason and heresy on Tower Hill on 28 July 1540. The king later expressed regret at the loss of his chief minister. Thomas Cromwell was born around 1485, in Putney, Surrey, the son of Walter Cromwell, a blacksmith, fuller and cloth merchant, and owner of both a hostelry and a brewery. Walter Cromwell is considered by some to be of Irish ancestry. Thomas's mother, Katherine, was the aunt of Nicholas Glossop of Wirksworth in Derbyshire. She lived in Putney in the house of a local attorney, John Welbeck, at the time of her marriage to Walter Cromwell in 1474. Cromwell had two sisters: the elder, Katherine, married Morgan Williams, a Welsh lawyer; the younger, Elizabeth, married a farmer, William Wellyfed. Katherine and Morgan's son, Richard, was employed in his uncle's service and changed his name to Cromwell. The site of Cromwell's birthplace is still pointed out by tradition and is in some measure confirmed by the survey of Wimbledon Manor, quoted above, for it describes on that spot 'an ancient cottage called the smith's shop, lying west of the highway from Richmond to Wandsworth, being the sign of the Anchor'. The plot of ground here referred to is now covered by the Green Man public house. Cromwell declared to Archbishop of Canterbury Thomas Cranmer that he had been a "ruffian… in his young days". As a youth, he left his family in Putney, and crossed the Channel to the continent. Accounts of his activities in France, Italy and the Low Countries are sketchy and contradictory. It is alleged[by whom?] that he first became a mercenary, and marched with the French army to Italy, where he fought in the Battle of Garigliano on 28 December 1503. While in Italy, he entered service in the household of the Florentine banker Francesco Frescobaldi. Later, he visited leading mercantile centres in the Low Countries, living among the English merchants and developing a network of contacts while learning several languages. At some point he returned to Italy. The records of the English Hospital in Rome indicate that he stayed there in June 1514, while documents in the Vatican Archives suggest that he was an agent for the Archbishop of York, Cardinal Christopher Bainbridge, and handled English ecclesiastical issues before the Roman Rota. Cromwell's wife died early in 1529 and his daughters, Anne and Grace, are believed to have died not long after their mother. Their death may have been to sweating sickness. Provisions made for Anne and Grace in Cromwell's will, dated 12 July 1529, were crossed out at some later date. Gregory outlived his father by only 11 years, succumbing to sweating sickness in 1551. Cromwell also had an illegitimate daughter, Jane (c. 1535–1580), whose early life is a complete mystery. According to novelist Hilary Mantel, "Cromwell had an illegitimate daughter, and beyond the fact that she existed, we know very little about her. She comes briefly into the records, in an incredibly obscure way—she's in the archives of the county of Chester." Jane married William Hough (c. 1527–1585), of Leighton in Wirral, Cheshire, around 1550. William Hough was the son of Richard Hough (1508–73/74) who was Cromwell's agent in Chester from 1534 to 1540. It is unknown what role Thomas and Gregory Cromwell played in her life. Jane and her husband William Hough remained staunch Roman Catholics, who, together with their daughter, Alice, her husband, William Whitmore, and their children, all came to the attention of the authorities as recusants during the reign of Elizabeth I. In 1517, and again in 1518, Cromwell led an embassy to Rome to obtain from Pope Leo X a papal bull for the reinstatement of Indulgences for the town of Boston, Lincolnshire. I amongst other have indured a parlyament which contenwid by the space of xvii hole wekes wher we communyd of warre pease Stryffe contencyon debatte murmure grudge Riches poverte penurye trowth falshode Justyce equyte dicayte [deceit] opprescyon Magnanymyte actyvyte foce [force] attempraunce [moderation] Treason murder Felonye consyli... [conciliation] and also how a commune welth myght be ediffyed and a[lso] contenewid within our Realme. Howbeyt in conclusyon we have d[one] as our predecessors have been wont to doo that ys to say, as well we myght and lefte wher we begann. In 1524, he was elected a member of Gray's Inn. I do entend (god wyllyng) this after none, whan my lord hathe dyned to ride to london and so to the Court, where I wyll other make or marre, or ere [before] I come agayn, I wyll put my self in the prese [press] to se what any man is Able to lay to my charge of ontrouthe or mysdemeanor. as well as numerous minor offices. From 1527, Henry VIII had sought to have his marriage to Queen Catherine of Aragon annulled, so that he could lawfully marry Anne Boleyn. At the centre of the campaign to secure the annulment was the emerging doctrine of royal supremacy over the church. By the autumn of 1531, Cromwell had taken control of the supervision of the king's legal and parliamentary affairs, working closely with Thomas Audley, and had joined the inner circle of the Council. By the following spring, he had begun to exert influence over elections to the House of Commons. The third session of what is now known as the Reformation Parliament had been scheduled for October 1531, but was postponed until 15 January 1532 because of government indecision as to the best way to proceed. Cromwell now favoured the assertion of royal supremacy, and manipulated the Commons by resurrecting anti-clerical grievances expressed earlier in the session of 1529. On 18 March 1532, the Commons delivered a supplication to the king, denouncing clerical abuses and the power of the ecclesiastical courts, and describing Henry as "the only head, sovereign lord, protector and defender" of the Church. The clergy resisted the Act of 1529 where they were prevented from appealing to Church-established courts, or Ecclesiastical court to settle disputes. Instead they were forced to go through the public courts as lay people. [clarification needed] The clergy capitulated when faced with the threat of parliamentary reprisal. On 14 May 1532, Parliament was prorogued. Two days later, Sir Thomas More resigned as Lord Chancellor, realising that the battle to save the marriage was lost. More's resignation from the Council represented a triumph for Cromwell and the pro-Reformation faction at court. The king's gratitude to Cromwell was expressed in a grant of the lordship of Romney[clarification needed] in Newport, Wales, and appointment to three relatively minor offices: Master of the Jewels on 14 April 1532, Clerk of the Hanaper on 16 July, and Chancellor of the Exchequer on 12 April 1533. None of these offices afforded much income, but the appointments were an indication of royal favour, and gave Cromwell a position in three major institutions of government: the royal household, the Chancery, and the Exchequer. On 26 January 1533, Audley was appointed Lord Chancellor, and Cromwell increased his control over the Commons through his management of by-elections. Henry and Anne married on 25 January 1533, after a secret marriage on 14 November 1532 that historians believe took place in Calais. On 23 May 1533, newly appointed Archbishop of Canterbury Thomas Cranmer declared Henry and Catherine's marriage null and void; five days later, he declared Henry and Anne's marriage valid. The parliamentary session began on 4 February, and Cromwell introduced a new bill restricting the right to make appeals to Rome. On 30 March, Cranmer was consecrated Archbishop of Canterbury, and Convocation immediately declared the king's marriage to Catherine unlawful. In the first week of April 1533, Parliament passed Cromwell's bill into law, as the Act in Restraint of Appeals, ensuring that any verdict concerning the king's marriage could not be challenged in Rome. On 11 April, Archbishop Cranmer sent the King a pro forma challenge to the validity of his marriage to Catherine. A formal trial began on 10 May 1533 in Dunstable and on 23 May the Archbishop pronounced sentence, declaring the marriage illegal. Five days later he pronounced the King's marriage to Anne to be lawful, and on 1 June, she was crowned queen. In December, the King authorised Cromwell to discredit the papacy and the Pope was attacked throughout the nation in sermons and pamphlets. In 1534 a new Parliament was summoned, again under Cromwell's supervision, to enact the legislation necessary to make a formal break of England's remaining ties with Rome. Archbishop Cranmer's sentence took statutory form as the Act of Succession, the Dispensations Act reiterated royal supremacy and the Act for the Submission of the Clergy incorporated into law the clergy's surrender in 1532. On 30 March 1534, Audley gave royal assent to the legislation in the presence of the King. In April 1534, Henry confirmed Cromwell as his principal secretary and chief minister, a position which he had held for some time in all but name. Cromwell immediately took steps to enforce the legislation just passed by Parliament. Before the members of both houses returned home on 30 March, they were required to swear an oath accepting the Act of Succession, and all the King's subjects were now required to swear to the legitimacy of the marriage and, by implication, to accept the King's new powers and the break from Rome. On 13 April, the London clergy accepted the oath. On the same day, the commissioners offered it to Sir Thomas More and John Fisher, Bishop of Rochester, both of whom refused it. More was taken into custody on the same day and was moved to the Tower of London on 17 April. Fisher joined him there four days later. On 18 April, an order was issued that all citizens of London were to swear. Similar orders were issued throughout the country. When Parliament reconvened in November, Cromwell brought in the most significant revision of the treason laws since 1352, making it treasonous to speak rebellious words against the Royal Family, to deny their titles, or to call the King a heretic, tyrant, infidel, or usurper. The Act of Supremacy also clarified the King's position as head of the church and the Act for Payment of First Fruits and Tenths substantially increased clerical taxes. Cromwell also strengthened his own control over the Church. On 21 January 1535, the King appointed him Royal Vicegerent and Vicar-General, and commissioned him to organise visitations of all the country's churches, monasteries, and clergy. In this capacity, Cromwell conducted a census in 1535 to enable the government to tax church property more effectively. The final session of the Reformation Parliament began on 4 February 1536. By 18 March, an Act for the Suppression of the Lesser Monasteries, those with a gross income of less than £200 per annum, had passed both houses. This caused a clash with Anne Boleyn, formerly one of Cromwell's strongest allies, who wanted the proceeds of the dissolution used for educational and charitable purposes, not paid into the King's coffers. Anne instructed her chaplains to preach against the Vicegerent, and in a blistering sermon on Passion Sunday, 2 April 1536, her almoner, John Skip, denounced Cromwell and his fellow Privy Councillors before the entire court. Skip's diatribe was intended to persuade courtiers and Privy Councillors to change the advice they had been giving the King and to reject the temptation of personal gain. Skip was called before the Council and accused of malice, slander, presumption, lack of charity, sedition, treason, disobedience to the gospel, attacking 'the great posts, pillars and columns sustaining and holding up the commonwealth' and inviting anarchy. he himself [Cromwell] has been authorised and commissioned by the king to prosecute and bring to an end the mistress's trial, to do which he had taken considerable trouble... He set himself to devise and conspire the said affair. Regardless of the role Cromwell played in Anne Boleyn's fall, and his confessed animosity to her, Chapuys's letter states that Cromwell claimed that he was acting with the King's authority. Most historians, however, are convinced that her fall and execution were engineered by Cromwell. The Queen and her brother stood trial on Monday 15 May, while the four others accused with them were condemned on the Friday beforehand. The men were executed on 17 May 1536 and, on the same day, Cranmer declared Henry's marriage to Anne invalid, a ruling that illegitimised their daughter, Princess Elizabeth. Two days later, Anne herself was executed. On 30 May, the King married Jane Seymour. On 8 June, a new Parliament passed the second Act of Succession, securing the rights of Queen Jane's heirs to the throne. Cromwell's position was now stronger than ever. He succeeded Anne Boleyn's father, Thomas Boleyn, 1st Earl of Wiltshire, as Lord Privy Seal on 2 July 1536, resigning the office of Master of the Rolls, which he had held since 8 October 1534. On 8 July 1536, he was raised to the peerage as Baron Cromwell of Okeham. Cromwell orchestrated the dissolution of the monasteries and visitations to the universities and colleges in 1535, which had strong links to the church. This resulted in the dispersal and destruction of many books deemed 'popish' and 'superstitious'. This has been described as 'easily the greatest single disaster in English literary history'. Oxford University was left without a library collection until Sir Thomas Bodley's donation in 1602. In July 1536, the first attempt was made to clarify religious doctrine after the break with Rome. Bishop Edward Foxe tabled proposals in Convocation, with strong backing from Cromwell and Cranmer, which the King later endorsed as the Ten Articles and which were printed in August 1536. Cromwell circulated injunctions for their enforcement that went beyond the Articles themselves, provoking opposition in September and October in Lincolnshire and then throughout the six northern counties. These widespread popular and clerical uprisings found support among the gentry and even the nobility; they were collectively known as the Pilgrimage of Grace. The rebels' grievances were wide-ranging, but the most significant was the suppression of the monasteries, blamed on the King's "evil counsellors", principally Cromwell and Cranmer. One of the leaders of the rebellion was Thomas Darcy, 1st Baron Darcy of Darcy, who gave Cromwell the prophetic warning (just prior to his execution) "others that have been in such favour with kings as you now enjoy have come to the same fate you bring me to". The suppression of the risings spurred further Reformation measures. In February 1537, Cromwell convened a vicegerential synod of bishops and doctors. The synod was co-ordinated by Cranmer and Foxe, and they prepared a draft document by July: The Institution of a Christian Man, more commonly known as the Bishops' Book. By October, it was in circulation, although the King had not yet given it his full assent. However, Cromwell's success in Church politics was offset by the fact that his political influence had been weakened by the emergence of a Privy Council, a body of nobles and office-holders that first came together to suppress the Pilgrimage of Grace. The King confirmed his support of Cromwell by appointing him to the Order of the Garter on 5 August 1537, but Cromwell was nonetheless forced to accept the existence of an executive body dominated by his conservative opponents. In January 1538, Cromwell pursued an extensive campaign against what was termed "idolatry" by the followers of the old religion. Statues, rood screens, and images were attacked, culminating in September with the dismantling of the shrine of St. Thomas Becket at Canterbury. Early in September, Cromwell also completed a new set of vicegerential injunctions declaring open war on "pilgrimages, feigned relics or images, or any such superstitions" and commanding that "one book of the whole Bible in English" be set up in every church. Moreover, following the "voluntary" surrender of the remaining smaller monasteries during the previous year, the larger monasteries were now also "invited" to surrender throughout 1538, a process legitimised in the 1539 session of Parliament and completed in the following year. The King was becoming increasingly unhappy about the extent of religious changes, and the conservative faction was gaining strength at court. Cromwell took the initiative against his enemies. He imprisoned the Marquess of Exeter, Sir Edward Neville, and Sir Nicholas Carew on charges of treason in November 1538, using evidence acquired from Sir Geoffrey Pole under interrogation in the Tower. All were executed in the following months. On 17 December 1538, the Inquisitor-General of France forbade the printing of Miles Coverdale's Great Bible. Cromwell persuaded the King of France to release the unfinished books so that printing could continue in England. The first edition was finally available in April 1539. The publication of the Great Bible was one of Cromwell's principal achievements, the first authoritative version in English. The King, however, continued to resist further Reformation measures. A Parliamentary committee was established to examine doctrine, and the Duke of Norfolk presented six questions on 16 May 1539 for the House to consider, which were duly passed as the Act of Six Articles shortly before the session ended on 28 June. The Six Articles reaffirmed a traditional view of the Mass, the Sacraments, and the priesthood. Queen Jane had died in 1537, less than two weeks after the birth of her only child, the future Edward VI. In early October 1539, the King finally accepted Cromwell's suggestion that he should marry Anne of Cleves, the sister of Duke Wilhelm of Cleves, partly on the basis of a portrait which Hans Holbein had painted of her. On 27 December, Anne of Cleves arrived at Dover. On New Year's Day 1540, the King met her at Rochester and was immediately repelled by her physically: "I like her not!" The wedding ceremony took place on 6 January at Greenwich, but the marriage was not consummated. Henry said that he found it impossible to enjoy conjugal relations with a woman whom he found so unattractive. On 18 April 1540, Henry granted Cromwell the earldom of Essex and the senior Court office of Lord Great Chamberlain. Despite these signs of royal favour, Cromwell's tenure as the King's chief minister was almost over. The King's anger at being forced to marry Anne of Cleves was the opportunity Cromwell's conservative opponents, most notably the Duke of Norfolk, needed to topple him. During 1536 Cromwell had proven himself an adept political survivor. However, the gradual slide towards Protestantism at home and the King's ill-starred marriage to Anne of Cleves, which Cromwell engineered in January 1540, proved costly. Some historians believe that Hans Holbein the Younger was partly responsible for Cromwell's downfall because he had provided a very flattering portrait of Anne which may have deceived the king. (The 65 × 48 cm painting is now displayed at the Louvre in Paris.) When Henry finally met her, the king was reportedly shocked by her plain appearance. It should be noted that Cromwell had passed on to Henry some exaggerated claims of Anne's beauty. The Franco-Imperial alliance had failed to materialise, and Henry had therefore been subjected to an unnecessary conjugal difficulty which loosened his Principal Secretary's control of events. In early 1540, Cromwell's conservative, aristocratic enemies, headed by the Duke of Norfolk and assisted by Bishop Gardiner (colloquially known as 'Wily Winchester'), saw in Catherine Howard an opportunity to displace their foe. Cromwell was arrested at a Council meeting on 10 June 1540, accused of a list of charges. He was imprisoned in the Tower. His enemies took every opportunity to humiliate him: they even tore off his Order of the Garter, remarking that "A traitor must not wear it." His initial reaction was defiance: "This then is my reward for faithful service!" he cried out, and angrily defied his fellow Councillors to call him a traitor. A Bill of Attainder containing a long list of indictments, including supporting Anabaptists, corrupt practices, leniency in matters of justice, acting for personal gain, protecting Protestants accused of heresy and thus failing to enforce the Act of Six Articles, and plotting to marry Lady Mary Tudor, was introduced into the House of Lords a week later and passed on 29 June 1540. He was also connected with 'sacramentarians' (those who denied transubstantiation) in Calais. All Cromwell's honours were forfeited and it was publicly proclaimed that he could only be called "Thomas Cromwell, cloth carder". 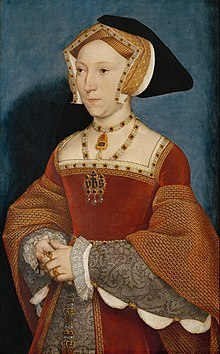 The King deferred the execution until his marriage to Anne of Cleves could be annulled: Anne, with remarkable common sense, happily agreed to an amicable annulment and was treated with great generosity by Henry as a result. Hoping for clemency, Cromwell wrote in support of the annulment, in his last personal address to the King. He ended the letter: "Most gracious Prince, I cry for mercy, mercy, mercy." Cromwell was condemned to death without trial, lost all his titles and property and was beheaded on Tower Hill on 28 July 1540 in a public execution, the day of the King's marriage to Catherine Howard. The executioner had great difficulty severing the head. Cromwell made a prayer and speech on the scaffold, professing to die, "in the traditional faith" [Catholic] and denying that he had aided heretics. Edward Hall, a contemporary chronicler, records that Cromwell then "so patiently suffered the stroke of the axe, by a ragged and Boocherly [butcher-like] miser, whiche very ungoodly perfourmed the Office". Afterwards, his head was set on a spike on London Bridge. Many lamented but more rejoiced, and specially such as either had been religious men, or favoured religious persons; for they banqueted and triumphed together that night, many wishing that that day had been seven years before; and some fearing lest he should escape, although he were imprisoned, could not be merry. Others who knew nothing but truth by him both lamented him and heartily prayed for him. But this is true that of certain of the clergy he was detestably hated, & specially of such as had borne swynge [beaten hard], and by his means was put from it; for in deed he was a man that in all his doings seemed not to favour any kind of Popery, nor could not abide the snoffyng pride of some prelates, which undoubtedly, whatsoever else was the cause of his death, did shorten his life and procured the end that he was brought unto. under pretext of some slight offences which he had committed, they had brought several accusations against him, on the strength of which he had put to death the most faithful servant he ever had. There remains an element of what G. R. Elton describes as 'mystery' about Cromwell's demise. In April 1540, just three months before he went to the block, he was created Earl of Essex and Lord Great Chamberlain. The arbitrary and unpredictable streak in the King's personality, which more than once exercised influence during his reign, had surfaced again and washed Cromwell away in its wake. During Cromwell's years in power, he skilfully managed Crown finances and extended royal authority. In 1536, he established the Court of Augmentations to handle the massive windfall to the royal coffers from the Dissolution of the Monasteries. Two other important financial institutions, the Court of Wards and the Court of First Fruits and Tenths, owed their existence to him, although they were not set up until after his death. He strengthened royal authority in the north of England, through reform of the Council of the North, extended royal power and introduced Protestantism in Ireland, and was the architect of the Laws in Wales Acts 1535 and 1542, which promoted stability and gained acceptance for the royal supremacy in Wales. He also introduced important social and economic reforms in England in the 1530s, including action against enclosures, the promotion of English cloth exports and the poor relief legislation of 1536. Although Cromwell always maintained a primarily political outlook on general affairs, there is consensus among scholars that at least while he held power he was a Protestant, with a Lutheran mindset. For him, the Henrician Reformation was certainly more than a jurisdictional revolution masquerading in religious garb. For instance, in the mid-1530s, he promoted Protestant ideas to forge an alliance with German Lutheran states, but his support for the Protestant cause is too general to be accurately explained in narrow political terms. In 1535 Cromwell succeeded in having clearly identified reformers, such as Hugh Latimer, Edward Foxe and Nicholas Shaxton appointed to the episcopacy. He encouraged and supported the work of reformers, such as Robert Barnes and obtained the license to publish the Matthew's Bible, provided significant funding for the printing of this English translation of the Bible and sent one to all parishes in England. By 1538, it was compulsory for all churches to own a Bible, in accordance with Cromwell's injunctions. The revised version, the Great Bible was widely available by 1539 and included a picture of Henry VIII, Thomas Cranmer and Cromwell on the title page. When Cromwell fell from favour in 1540, his alleged support for Anabaptism was cited. Although the charge was spurious, the fact that it was levelled at all demonstrates the reputation for evangelical sympathies Cromwell had developed. Until the 1950s, historians discounted Cromwell's role, calling him a doctrinaire hack who was little more than the agent of the despotic King Henry VIII; for example the 1911 Encyclopædia Britannica states "his power has been overrated." Geoffrey Elton, however, featured him as the central figure in the Tudor revolution in government in The Tudor Revolution (1953). Elton portrayed Cromwell as the presiding genius, much more so than the king, handling the break with Rome and creating the laws and administrative procedures that reshaped post-Reformation England. Elton wrote that Cromwell had been responsible for translating royal supremacy into parliamentary terms, creating powerful new organs of government to take charge of Church lands, and largely removing the medieval features of central government. Subsequent historians have agreed with Elton as to Cromwell's importance, though not with his claims of "revolution". Leithead (2004) wrote, "Against significant opposition he secured acceptance of the king's new powers, created a more united and more easily governable kingdom, and provided the crown, at least temporarily, with a very significant landed endowment." Cromwell's illegitimate daughter Jane had a daughter Alice with her husband William Hough. Puritan leader Oliver Cromwell was the great-grandson of Richard Cromwell, Thomas Cromwell's nephew. Actor Danny Dyer discovered that he was the fifteen times great-grandson of Cromwell in the BBC series Who Do You Think You Are? 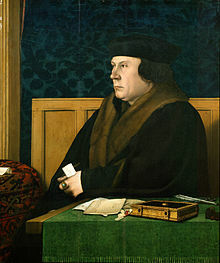 Thomas Cromwell was a patron of Hans Holbein the Younger, as were St. Thomas More and Anne Boleyn. In the New York Frick Collection, two portraits by Holbein hang facing each other on the same wall of the Study, one depicting Thomas Cromwell, the other Thomas More, whose execution he had procured. Cromwell has been portrayed in a number of plays, feature films, and television miniseries, usually as a villainous character. More recently, however, Hilary Mantel's two Man Booker Prize-winning novels Wolf Hall (2009) and Bring up the Bodies (2012) have sought to show him in a more sympathetic light, stressing his family affections, genuine respect for Cardinal Wolsey, zeal for the Reformation, and support for a limited degree of social reform. Cromwell is a supporting character in William Shakespeare and John Fletcher's 1613 play Henry VIII. He is the subject of Thomas Lord Cromwell, a 1602 play. It is attributed on the title pages of the 1603 and 1613 editions to 'W.S. ', and is classed as part of Shakespearean apocrypha. In the original stage production of Maxwell Anderson's Anne of the Thousand Days, which deals with the marriage of Henry VIII and Anne Boleyn, Cromwell was portrayed by Wendell K. Phillips. He is depicted here as totally ruthless and unscrupulous. Cromwell is the main antagonist in Robert Bolt's play A Man for All Seasons, in which he is portrayed as ruthlessly ambitious and jealous of Sir Thomas More's influence with the King. Cromwell was played by Andrew Keir when the play opened in London, and by Leo McKern on Broadway. Cromwell was portrayed by John Dougall in Shakespeare's Globe's production of Anne Boleyn by Howard Brenton in 2010, and Julius D'Silva in 2011. Cromwell was portrayed in Henry VIII The Musical, a youth production that premièred in London in 2012. In 2014 the Royal Shakespeare Company staged an adaptation by Mike Poulton of Dame Hilary Mantel's first two Cromwell novels. The role of Cromwell was played by Ben Miles, who repeated his portrayal of Cromwell when the production of Wolf Hall parts I and II moved to Broadway in March 2015  where he earned a Tony Award nomination for his work. Thomas Cromwell is portrayed in the series of novels by Anne Stevens, as a benevolent tyrant. The series 'Tudor Crimes' covers the years from 1529 to 1551 in great depth and provides us with a dichotomy of a man, humane to the poor, yet ruthless to the nobility. Winter King is the first book in this series. Cromwell is the subject of Hilary Mantel's novels Wolf Hall (2009) and Bring Up the Bodies (2012), which explore his humanity and to some extent rebut the unflattering portrait in A Man for All Seasons. Wolf Hall won the 2009 and Bring Up the Bodies the 2012 Man Booker Prize. Cromwell is one of the major characters of "Frailty of Human Affairs" (2017), book one of the Queenmaker Series, by New Zealand author Caroline Angus Baker. Cromwell is a leading character in the first two Matthew Shardlake historical crime fiction novels by C. J. Sansom, Dissolution and Dark Fire. He is given minor roles in two of Philippa Gregory's novels, The Other Boleyn Girl (2001) and The Boleyn Inheritance. He is one of the major characters in H. F. M. Prescott's novel The Man on a Donkey, which depicts a power struggle between Cromwell and Lord Darcy, who represents the old nobility. He is a major character in The Fifth Queen by Ford Madox Ford. Franklin Dyall portrayed Cromwell in The Private Life of Henry VIII (1933). In the film A Man for All Seasons, Cromwell was played by Leo McKern, who also played the role on stage on Broadway. Cromwell has also been portrayed by John Colicos in the film Anne of the Thousand Days (1969), by Kenneth Williams in the classic British comedy Carry On Henry (1971), by Donald Pleasence in Henry VIII and His Six Wives (1972), and by Iain Mitchell in The Other Boleyn Girl (2008). Cromwell was played by Wolfe Morris in the BBC miniseries The Six Wives of Henry VIII (1970), and by Danny Webb in the Granada Television production Henry VIII (2003). In the television version of The Other Boleyn Girl (2003), he was played by veteran actor Ron Cook. In the television series The Tudors (2007), Cromwell is played by English actor James Frain; he is portrayed as Machiavellian, cunning and devoted to the English Reformation at any cost, though he is not entirely unsympathetic. Frain played the character for three seasons; Cromwell's execution brought the third season to its conclusion. In The Twisted Tale of Bloody Mary (2008), an independent film from TV Choice Productions, Cromwell is played by Burtie Welland. Thomas Cromwell, played by Mark Rylance, is the central figure in the BBC's six-part series Wolf Hall, based on Hilary Mantel's novels Wolf Hall and Bring Up the Bodies, which was first broadcast on 21 January 2015. ^ "Cromwell". Collins English Dictionary. HarperCollins. Retrieved 18 December 2013. ^ Logan argues that these titles refer to a single position. F. Donald Logan (July 1988). "Thomas Cromwell and the Vicegerency in Spirituals: A Revisitation". The English Historical Review. 103 (408): 658–67. JSTOR 572696. ^ Peter C. Herman (2011). A Short History of Early Modern England: British Literature in Context. John Wiley & Sons. p. 82. ISBN 9781444394993. ^ Hutchinson 2008, p. 269. ^ a b c d e f g h i j k l m n o p q r s t u v w x y z aa ab ac ad ae af Leithead 2008. ^ Diarmaid MacCulloch (27 September 2018). Thomas Cromwell: A Life. Penguin Books Limited. p. 36. ISBN 978-0-14-196766-0. ^ Walford 1878, pp. 489–503. ^ a b "Thomas Cromwell's life before Henry VIII". ^ Kinney 2001, p. 172. ^ a b c Fitzgerald and MacCulloch 2016. ^ Schofield 2011, pp. 16, 23, 33. ^ Schofield 2011, p. 33. ^ Merriman I 1902, pp. 59, 60. ^ Cokayne III 1913, pp. 557–559. ^ Strype II(I) 1822, pp. 493–494. ^ Hoby 1902, p. 73. ^ Winchester 1955, p. 270. ^ Beazley 1908, p. 82: Jane Hough was buried 3 November 1580 at Neston. ^ Miller, George. "Hilary Mantel interview revisited". Podularity.com. Retrieved 26 November 2013. ^ a b c Bindoff 1982. ^ Glover 1882, pp. 127–128. ^ a b Edwards 1982. ^ Letters and Papers, Foreign and Domestic, Henry VIII, 14(2), 782: Cromwell's accounts note a payment of £12 14s. 4d. for 'apparel for Mrs. Jane' on 23 May 1539. ^ Glover 1882, pp. 127–28. ^ Noble II 1787, p. 5. ^ Ormerod 1819, p. 304. ^ Wark 1971, pp. 153, 168. ^ Elton 1991a, p. 2. ^ Hutchinson 2008, pp. 271–276. ^ Eric Ives "the Life and Death of Anne Boleyn"
^ Ives 2005, pp. 307–310. ^ Schofield 2011, pp. 176–179. ^ Schofield 2011, pp. 192–205. ^ Lipscomb & April 2013, p. 23. ^ Calendar of State Papers, Spain, 5(2), 61, and footnote 1. ^ Letters and Papers, Foreign and Domestic, Henry VIII, 10, 1069. ^ Weir, Alison (5 January 2010). The Lady in the Tower: The Fall of Anne Boleyn. Random House Publishing Group. p. 56. ISBN 9780345519788. Retrieved 14 January 2018 – via Google Books. ^ Bordo, Susan (1 February 2014). The Creation of Anne Boleyn. Oneworld Publications. ISBN 9781780744292. Retrieved 14 January 2018 – via Google Books. ^ Weir, Alison (5 January 2010). The Lady in the Tower: The Fall of Anne Boleyn. Random House Publishing Group. p. 112. ISBN 9780345519788. Retrieved 14 January 2018 – via Google Books. ^ Letters and Papers, Foreign and Domestic, Henry VIII, 11, 202(3) and 202(14). ^ John Lawson (15 April 2013). Mediaeval Education and the Reformation. ISBN 9781135031091. Retrieved 17 November 2015. ^ Weir 1991, pp. 377–78, 386–88, 395, 405, 410–11. ^ Weir 1991, pp. 412, 418. ^ Elton, G. R. (12 October 2012). England Under the Tudors. Routledge. p. 157. ISBN 9781136786600. Retrieved 14 January 2018 – via Google Books. ^ Warnicke, Retha M. (13 April 2000). The Marrying of Anne of Cleves: Royal Protocol in Early Modern England. Cambridge University Press. p. 77. ISBN 9780521770378. Retrieved 14 January 2018 – via Google Books. ^ Muhlbach, Luise (14 May 2010). Henry VIII and his Court. Andrews UK Limited. ISBN 9781849891172. Retrieved 14 January 2018 – via Google Books. ^ Beckingsale, B. W. (17 June 1978). Thomas Cromwell: Tudor Minister. Springer. ISBN 9781349016648. Retrieved 14 January 2018 – via Google Books. ^ Everett, Michael (1 March 2015). "The Rise of Thomas Cromwell: Power and Politics in the Reign of Henry VIII, 1485-1534". Yale University Press. p. 141. Retrieved 14 January 2018 – via Google Books. ^ "The Complete Peerage", new edition by Hon. Vicary Gibbs, (St Catherine Press, London), vol III, p. 557. ^ Weir 1991, pp. 419–20. ^ Hutchinson 2008, p. 254. ^ Borman, Tracy (11 September 2014). Thomas Cromwell: The Untold Story of Henry VIII's Most Faithful Servant. Hodder & Stoughton. ISBN 9781444782875. Retrieved 14 January 2018 – via Google Books. ^ a b Beckingsale, B. W. (17 June 1978). Thomas Cromwell: Tudor Minister. Springer. p. 143. ISBN 9781349016648. Retrieved 14 January 2018 – via Google Books. ^ Hall 1809, p. 839. ^ Hall 1809, pp. 838–839. ^ Letters and Papers, Foreign and Domestic, Henry VIII, 16, 590. ^ Whelan, Frederick G. (14 January 2018). Hume and Machiavelli: Political Realism and Liberal Thought. Lexington Books. p. 269. ISBN 9780739106310. Retrieved 14 January 2018 – via Google Books. ^ Rogers, John; Johnson, Joseph W. (14 January 2018). Matthew's Bible: A Facsimile of the 1537 Edition. Hendrickson Publishers. ISBN 9781598563498. Retrieved 14 January 2018 – via Google Books. ^ Farstad, Arthur L. (8 April 2014). The New King James Version: In the Great Tradition. Thomas Nelson. ISBN 9780718021788. Retrieved 14 January 2018 – via Google Books. ^ "Thomas Cranmer - archbishop of Canterbury". Britannica.com. Retrieved 14 January 2018. ^ Corporation, British Broadcasting. "BBC - Radio 4 Voices of the Powerless - 08/08/2002 featuring the Reformation's dates". Bbc.co.uk. Retrieved 14 January 2018. ^ Hutchinson, Robert (23 February 2012). Thomas Cromwell: The Rise And Fall Of Henry VIII's Most Notorious Minister. Orion Publishing Group. p. 117. ISBN 9781780223780. Retrieved 14 January 2018 – via Google Books. ^ "Great Bible (Full Story) - Early English Bibles". Earlyenglishbibles.com. Retrieved 14 January 2018. ^ Manganiello, Stephen C. (14 January 2018). The Concise Encyclopedia of the Revolutions and Wars of England, Scotland, and Ireland, 1639-1660. Scarecrow Press. p. 15. ISBN 9780810851009. Retrieved 14 January 2018 – via Google Books. ^ "1911 Encyclopædia Britannica/Cromwell, Thomas, Earl of Essex - Wikisource, the free online library". ^ Bernard 1998, pp. 587–607 Bernard argues Elton exaggerated Cromwell's role. ^ Coby 2009, p. 197. ^ Kenyon 1983, p. 210. ^ Richardson, Magna Carta Ancestry III 2011, p. 111. ^ Richardson, Plantagenet Ancestry I 2011, p. 604. ^ Collins, Arthur (1741). "The English Baronetage: Containing a Genealogical and Historical Account of All the English Baronets, Now Existing: Their Descents, Marriages, and Issues; Memorable Actions, Both in War, and Peace; Religious and Charitable Donations; Deaths, Places of Burial and Monumental Inscriptions". Tho. Wotton. p. 499. Retrieved 14 January 2018 – via Google Books. ^ Williams 1975, p. 142. ^ Acocella, Joan (19 October 2009). "Tudor Tales". The New Yorker. Retrieved 23 March 2016. ^ "Henry VIII The Musical". Henryviiithemusical.com. Retrieved 9 February 2014. ^ "Wolf Hall Part One-details". IBDb.com. Retrieved 17 November 2015. ^ "Ben Miles profile". IBDb.com. Retrieved 17 November 2015. ^ "A Man for All Seasons, full cast". Internet Movie Database. Retrieved 28 October 2014. ^ "Mark Rylance set for Hilary Mantel TV drama". BBC News. 8 March 2012. Retrieved 16 February 2015. Beazley, F. C. (1908). Notes on the Parish of Burton in Wirrall. Illustrated with seven plates and numerous coats of arms drawn by Graham Johnston, Herald Painter to the Lyon Court. Liverpool: Henry Young & Sons. Bindoff, S. T. (1982). "Cromwell, Thomas (by 1485–1540), of London". In Bindoff, S. T. (ed.). Members. The History of Parliament: the House of Commons 1509–1558. Historyofparliamentonline.org. Retrieved 21 October 2013. Blomefield, Francis (1808). "Launditch Hundred: Elmham". An Essay Towards a Topographical History of the County of Norfolk. 9. British-history.ac.uk. Brigden, Susan (June 1981). "Popular Disturbance and the Fall of Thomas Cromwell and the Reformers, 1539–1540". Historical Journal. 24 (2): 257–278. doi:10.1017/s0018246x0000546x. JSTOR 2638786. "Calendar of State Papers, Spain". British-history.ac.uk. Retrieved 9 February 2014. Coby, J. Patrick (2009). Thomas Cromwell: Machiavellian Statecraft and the English Reformation. Lanham: Lexington Books. ISBN 978-0739134030. Edwards, P. S. (1982). "HOUGH, Richard (1505-73/74), of Leighton and Thornton Hough, Cheshire.". In Bindoff, S. T. (ed.). Members. The History of Parliament: The House of Commons 1509–1558. 2: Members D-M. London: Published for The History of Parliament Trust by Secker & Warburg. ISBN 978-0436042829. Retrieved 24 September 2014. Elton, G. R. (1991). Thomas Cromwell. Headstart History Papers. Bangor: Headstart History. ISBN 978-1873041154. Elton, G. R. (1951). "Thomas Cromwell's Decline and Fall". Cambridge Historical Journal. 10 (2): 150–185. doi:10.1017/S1474691300002766. JSTOR 3021084. Elton, G. R. (1956). "The Political Creed of Thomas Cromwell". Transactions of the Royal Historical Society. Fifth Series. 6: 69–92. doi:10.2307/3678841. JSTOR 3678841. Elton, Geoffrey (December 1993). "How Corrupt was Thomas Cromwell?". Historical Journal. 36 (4): 905–908. doi:10.1017/s0018246x00014552. JSTOR 2640037. Elton, Geoffrey Rudolph (1953). The Tudor Revolution in Government: Administrative Changes in the Reign of Henry VIII. Cambridge University Press. Elton, Geoffrey Rudolph (1973). Reform and Renewal: Thomas Cromwell and the Common Weal. Cambridge: Cambridge University Press. ISBN 978-0521200547. Elton, Geoffrey Rudolph (1974). "An Early Tudor Poor Law". Studies in Tudor and Stuart Politics and Government. II. London: Cambridge University Press. pp. 137–154. doi:10.1017/CBO9780511561108.006. ISBN 9780511561108. Elton, Geoffrey Rudolph (1974). "King or Minister? The Man behind the Henrician Reformation". Studies in Tudor and Stuart Politics and Government. I. Cambridge: Cambridge University Press. pp. 173–188. doi:10.1017/CBO9780511561092.010. ISBN 9780511561092. Elton, Geoffrey Rudolph (1985). Policy and Police: The Enforcement of the Reformation in the Age of Thomas Cromwell. Cambridge: Cambridge University Press. ISBN 9780521313094. Elton, Geoffrey Rudolph (1991). England Under the Tudors (3rd ed.). London: Routledge. ISBN 9780415065337. Gerhold, Dorian (2017). Thomas Cromwell and his Family in Putney and Wandsworth. Wandsworth Papers. 31. London: Wandsworth Historical Society. ISBN 9780905121406. Glover, Robert (1882). Rylands, John Paul (ed.). The Visitation of Cheshire in the year 1580, made by Robert Glover, Somerset Herald, for William Flower, Norroy King of Arms: with numerous additions and continuations, including those from the Visitation of Cheshire made in the year 1566 by the same herald : with an appendix containing the Visitation of a part of Cheshire in the year 1533, made by William Fellows, Lancaster Herald, for Thomas Benolte, Clarenceux King of Arms : and a fragment of the Visitation of the city of Chester in the year 1591, made by Thomas Chaloner, Deputy to the Office of Arms. Publications of the Harleian Society. 18. London: Harleian Society. Hall, Edward (1809). Hall's chronicle; containing the history of England, during the reign of Henry the Fourth, and the succeeding monarchs, to the end of the reign of Henry the Eighth, in which are particularly described the manners and customs of those periods. London: Printed for J. Johnson; F. C. and J. Rivington; T. Payne; Wilkie and Robinson; Longman, Hurst, Rees and Orme; Cadell and Davies; and J. Mawman. Hutchinson, Robert (2008). Thomas Cromwell: The Rise and Fall of Henry VIII's Most Notorious Minister. London: Phoenix. ISBN 978-0-7538-2361-3. Ives, Eric (2005). 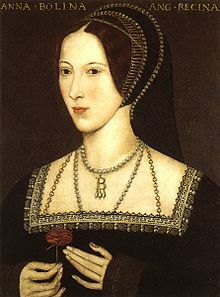 The Life and Death of Anne Boleyn: 'The Most Happy'. Blackwell Publishing. ISBN 978-1-4051-3463-7. Kenyon, John Philipps (1983). The History Men: The Historical Profession in England Since the Renaissance. London: Weidenfeld & Nicolson. ISBN 978-0297780816. Kinney, Arthur; Swain, David W. (2001). Tudor England: An Encyclopedia. Garland. ISBN 978-0815307938. "Letters and Papers, Foreign and Domestic, Henry VIII". British-history.ac.uk. Retrieved 9 February 2014. Logan, F. Donald (July 1988). "Thomas Cromwell and the Vicegerency in Spirituals: A Revisitation". English Historical Review. 103 (408): 658–667. doi:10.1093/ehr/ciii.ccccviii.658. MacCulloch, Diarmaid (2018). Thomas Cromwell: A Revolutionary Life. New York: Viking. ISBN 9780670025572. Noble, Mark (1787). Memoirs of the Protectoral House of Cromwell. II (3rd ed.). London: G.G.J. and J. Robinson. Ormerod, George (1819). History of Cheshire, The History of the County Palatine and city of Chester. II. London: Printed for Lackington, Hughes. Harding, Mavor, and Jones. Richardson, Douglas (2011). Everingham, Kimball G. (ed.). Magna Carta Ancestry: A Study in Colonial and Medieval Families. III (2nd ed.). ISBN 978-1461045205. Richardson, Douglas (2011). Everingham, Kimball G. (ed.). Plantagenet Ancestry: A Study in Colonial and Medieval Families. I (2nd ed.). CreateSpace. ISBN 978-1461045137. Schofield, John (2011). The Rise & Fall of Thomas Cromwell: Henry VIII's Most Faithful Servant. The History Press. ISBN 978-0-7524-5866-3. Walford, Edward (1878). "Putney". Old and New London. 6. British-history.ac.uk. pp. 489–503. Retrieved 9 February 2014. Wark, K. R. (1971). Elizabethan Recusancy in Cheshire (hardback). Remains Historical and Literary Connected with the Palatine Counties of Lancaster and Chester. 3rd series. 19. Manchester: Manchester University Press for the Chetham Society. ISBN 978-0-7190-1154-2. Weir, Alison (1991). The Six Wives of Henry VIII. New York: Grove Weidenfeld. ISBN 978-0802114976. Williams, Neville (1975). The Cardinal & the Secretary. London: Weidenfeld and Nicolson. ISBN 978-0-297-76960-6. Wikimedia Commons has media related to Thomas Cromwell, 1st Earl of Essex. Stephen, Leslie, ed. (1888). "Cromwell, Thomas (1485?-1540)" . Dictionary of National Biography. 13. London: Smith, Elder & Co. p. 194. "Archival material relating to Thomas Cromwell". UK National Archives.